We understand that each project brings its own set of challenges. The overall physical space, surrounding architecture, timeline, budget, and your design sensitivities must all be considered in developing a successful project. We begin this process with an onsite visit to gain an understanding of your specific needs. We’ll discuss the overall design goals as well as discuss any example pieces that you may have seen and would like to draw inspiration from. We can also offer our design services. After securing your deposit/retainer, we begin drafting preliminary sketches using AutoCAD based on the results of the initial consultation meeting. Depending on the Design Service Agreement, as many as three different design concepts can be offered. After any revisions a final design drawing will be offered for final approval before any work begins. Once the design has been finalized and accepted, materials are ordered and we begin the process of fabrication. Using various tools such as air hammers, hydraulic benders, welding equipment and of course the forge, the conceptual drawings and ideas discussed earlier begin to come to life. Full scale drawings are produced an a plotter and used in the shop as layout drawings. 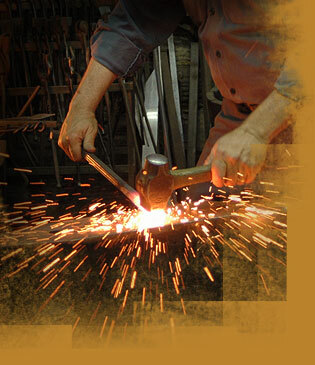 Material is cut, forged, hammered or textured and assembled to create what was drawn into a functional piece of metalwork to be enjoyed for generations. The finishing process is an extremely important phase in producing a quality product. It is not just about color. Detailed grinding and sanding are required to insure that connection joints are smooth to the hand and the overall appearance of the project is clean and crisp. Once the project passes inspection from the grinding department the project moves to color. Color is the accent that enhances the beauty of the work wothout overpowering it. For iron—natural finishes and patinas are choice with faux finishes and paints being desired options. For aluminum—powder coat finishes are choice with color selections that are unlimited. All exterior pieces are treated prior to the final finish to insure a lasting protective finish. In addition to maintaining a high quality of standards during the development of your project, each completed fabrication is professionally installed by our own in-house team to ensure the successful completion of your project.